A biography about Vladimir Ussachevsky and his musical experiences with the electronic medium, in particular with the computer at Bell Labs. A musical family – The musical career of Vladimir Ussachevsky, and his formal training, take place in the United States, but he is an asiatic children when his mother gave birth to the little Vladimir, at Hailar in Manchuria. So, Ussachevsky lived two distinct step: before to choice to go in America, and after this choice. We affirm the same for his musical training: a first step characterized by a family training, and a second step based on formal studies in the U.S. The young Vladimir grew in a very stimulant family environment: the father was even a music events organizer; the mother was a good pianist, but appreciated in particular for her teaching work; then he had a sister violinist, and two brothers have become famous pianists. Ussachevsky initially was interested by playing the piano, for which he writes the early compositions. Is not casual that Ussachvesky in the early experiences was interested by neo-Romantic aesthetics. The formal study – The subject of this site, leading me to recommend others articles or books to examine in depth the life of Vladimir Ussachevsky. Now, I want underline only those information useful for the our topic. In the Thirties, Vladimir Ussachevsky opts to follow his family in the U.S., where he began to improve his musical training as student of the Eastman School of Music located in Rochester, New York. After this, there were others important stages: in 1937 he becomes american citizen; in 1939 obtained the Ph.D in Composition and, finally, in 1941 he went to California to attend qualifying courses to music teaching. A very linear career, if the world was not devasted by a terrible war. In 1947, at the end of the war and after returning to a civil life, Ussachevsky was called to teaching at the Columbia University, in New York, where he stayed for a very long time, as a composer, and teacher, and much other. 1951 – After the early neo-Romantic experiences, in 1951 Ussachevsky meets a new step of his career. In that year the Columbia University purchased the first tape recorder, who remains unused for various weeks. 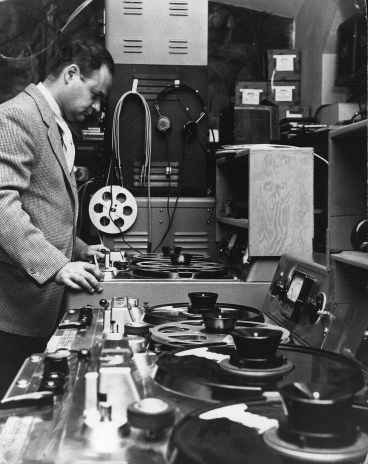 When Ussachevsky encounter Peter Mauzey, an engineering student working at WKCR (the Columbia University radio station), he learning how use the tape recorder to altering concrete sounds and get new timbral solutions overlapping various sound layers. 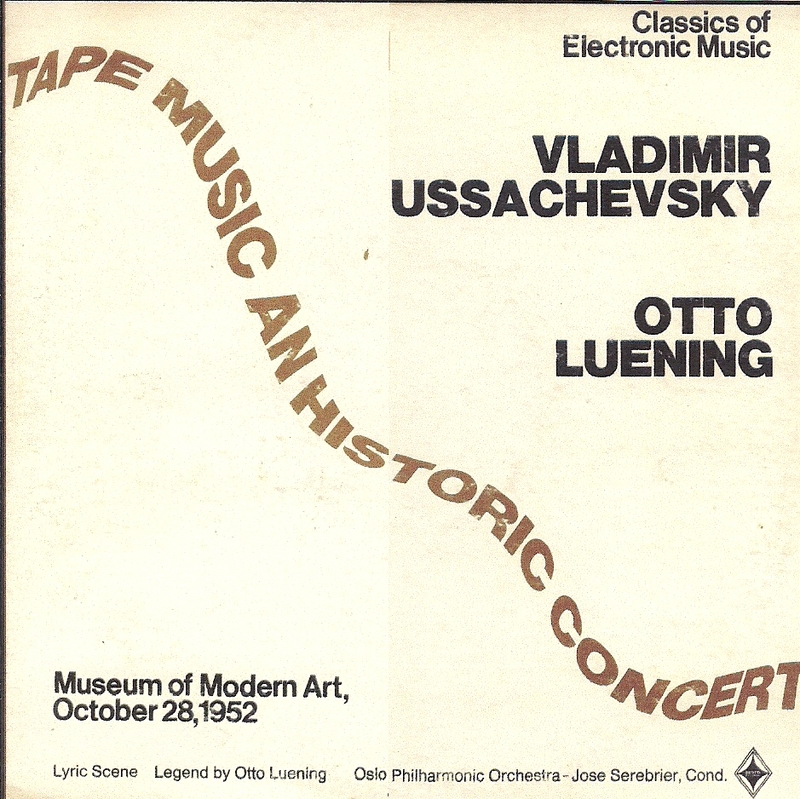 After some early personal experiments, realized in the same months wherein in Europe, in occasion of the Darmstadt International Summer Courses for New Music, were presented the first electronic works, the 9th May 1952 Ussachevsky participates to the Composers Forum concert with an electronic composition titled Underwater Valse (1952), realized with an Ampex 400 tape recorder. In August Otto Luening invited Ussachevsky to Vermont Composers Conference to present others electronic experiments. 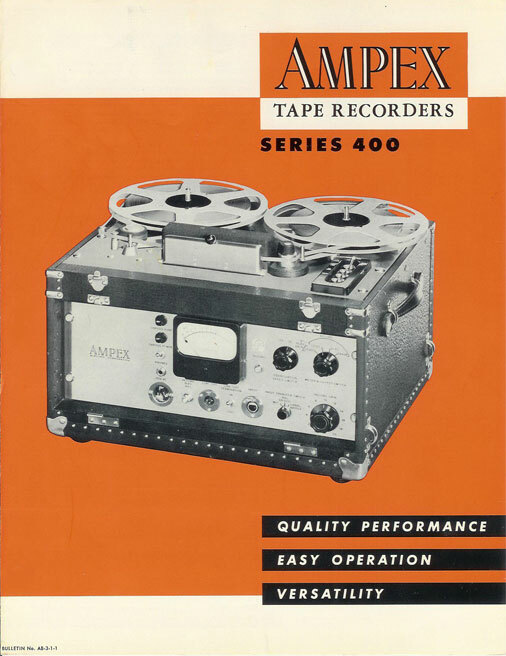 Ampex 400 tape recorder. Available the studio and portable version too. Sonic Contours – After the early musical experiments, Otto Luening offers to Ussachevsky a new opportunity to compose a piece of electronic music. Luening was involved by Leopold Stokowski to organize a evening concert at the Modern Art Museum in New York. The main problem in those years was the lack of a electronic music studio. So, with the Ampex and a big loudspeaker, a sort of “music center” opening at the Henry Cowell‘s house, where Ussachevsky worked to a composition that he titled Sonic Contours, the first with an aesthetic value. Ussachevsky finished this work at the private studio of Arturo Toscanini, set in Villa Pauline in Riverdale by David Sarser, the personal sound engineer of the famous Maestro. In October 28, Sonic Contours was played together with some works of Otto Luening (Low Speed, Invention, e Fantasy in space). La copertina del Long Playing con la registrazione della serata di Vladimir Ussachevsky e Otto Luening al Museo d’Arte Moderna di New York. I am often asked: What is tape music, and how is it made? Tape music is music that is composed directly with sound instead of first being written on paper and later made to sound […] so, essentially, it is a new way of doing what has been done for centuries by old methods. Another recording of that years give us an idea of the importance of these pioneering in electronic music: in 1958 a collection published by Folkways Records, titled Sounds of New Music, involved Sonic Contours with the early musical experiments of Ussachevsky but also compositions of others avant-garde composers such as Edgard Varése, John Cage, Henry Cowell, Otto Luening and many others. I want to attach the scanner of the internal booklet. 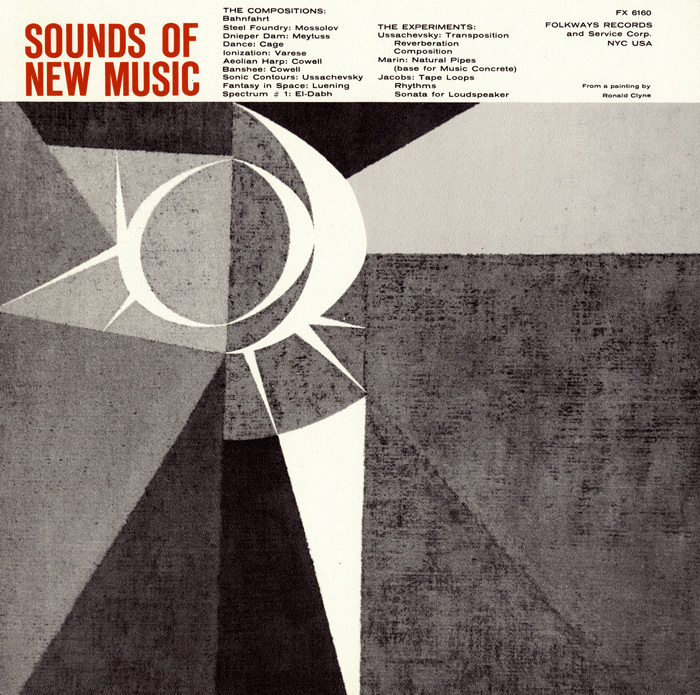 Cover of Sounds of New Music (Folkways Records, 1958). We can note how Vladimir Ussachevsky gave attention to underline the distinction between Sonic Contours and those composition he considered as experiments. These first activities, ends with another event which involves Leopold Stokowski again. The famous conductor in 1953 called Luening and Ussachevsky to present a new electronic work for the CBS “Twentieth Century Concert Hall” radio broadcast. For this occasion they compose Incantation for Tape Recorder. In 1954 they compose one of the first electronic music involving a large symphonic orchestra: Rhapsodic Variations, for orchestra and tape, commission of the Louisville Orchestra. 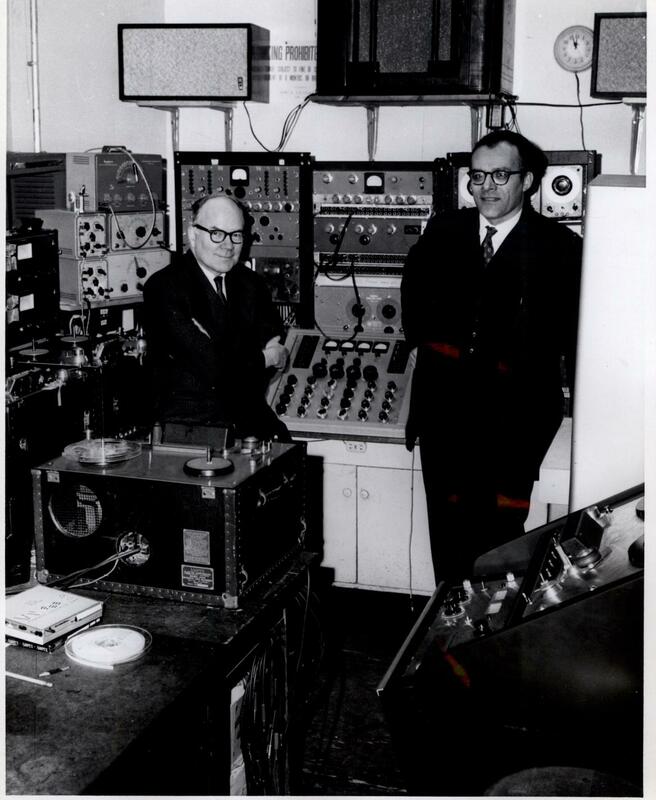 Otto Luening e Vladimir Ussachevsky in una salla dell’Columbia-Princeton Electronic Music Center. Columbia-Princeton Electronic Music Center – In 1955 Harry Olson and Herbert Belar published a paper who presented the RCA synthesizer developed at Princeton. After knowing this news Luening and Ussachevsky wanted to buy it and so they called Milton Babbitt for a expert advice. By this encounter arise the idea of a new center devoted to electronic music. Thanks to the Rockefeller Foundation in 1959 the Columbia-Princeton Electronic Music Center was established. The management was entrusted to four famous contemporary composer: Luening and Ussachevsky as Columbia representatives, while Milton Babbitt and Roger Sessions for the Princeton University. The opening contract envisaged to buy a RCA synthesizer, in fact already in 1957 the Mark II was assembled. 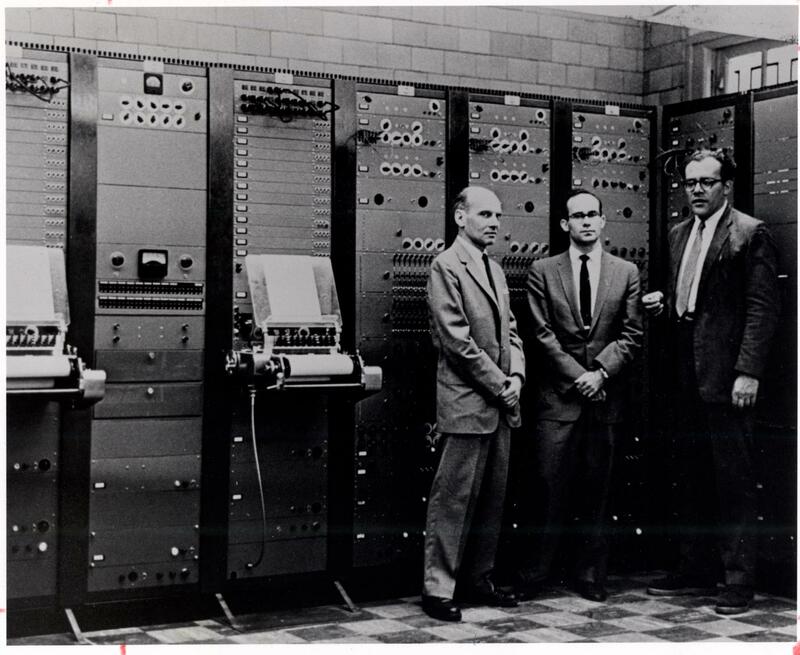 From left: Milton Babbitt, Peter Mauzey and Vladimir Ussachevsky in front of the RCA Mark II synthesizer. Edgard Varèse – It’s obvious that the CPEMC rapidly became a place very popular among for most of the composers still life. Among many we can consider Edgard Varèse. 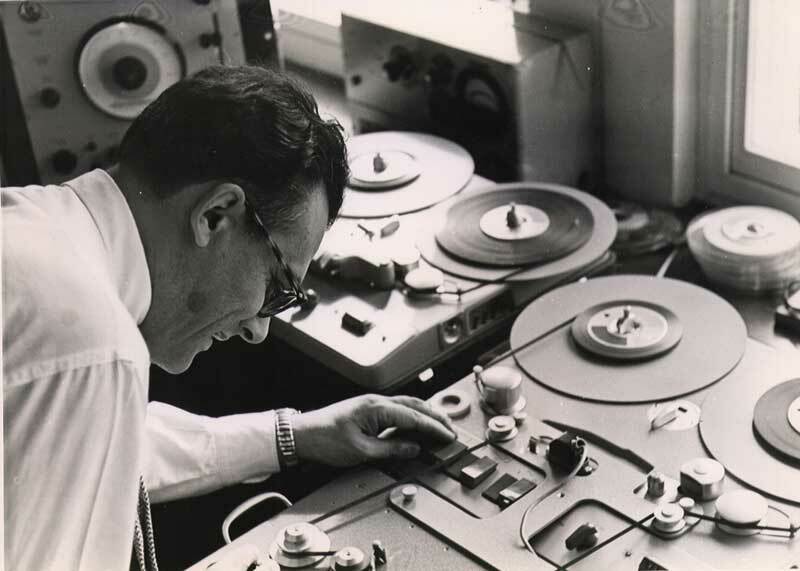 Ussachevsky invited him many times but Varèse, who lived in New York, goes to CPEMC only in 1961, when the French composer wanted to improve the tape quality that contained the interpolations of Déserts. This work linked Ussachevsky to Max Mathews which was part of the collaboration team. We must remember that Mathews already by 1957 tested the computer for musical goals. Lajaren Hiller – Anyway, this is not the first event in which Ussachevsky knows someone occupied with computer music. In fact even the research by Lejaren Hiller at the University of Illinois was familiar for Ussachevsky; insomuch as when he was appointed Director of the New Music Edition (a music journal devoted to contemporary scores) did publish the Illiac Suite score. However, aside from this educational interest, Ussachevsky wasn’t interested to the compositional approach adopted by Hiller, i.e. computer assisted composition. Bell Labs – Initially Ussachevsky wasn’t interested to computer music generally. Besides Hiller, even the research at Bell Labs wasn’t interesting for him. Max Mathews, a pioneer in computer music experiments, remember that only the manipulation of concrete sounds through the computer interested Ussachevsky. Here’s why the first collaboration at Bell Labs was with Sandy Prushansky, a researcher called to develop a software for sound mixing. Vladimir Ussachevsky composing with the tape recorder. Groove – Gradually Ussachevsky approach a more deepened computer use. After this early experiments, he tried the sound synthesis by computer, first with the Music V software designed by Max Mathews in 1968. This latter, simultaneously, planne a new digital system for real time music. In 1970 the Groove synthesizer was realzied. This is a hybrid synth with a digital part for sound control and an analogical section to synthesize. Computer Piece – The first composition realized by Ussachevsky with digital instruments is Computer Piece. A curious story tells us how many difficulties Ussachevsky encountered. The March 5, 1968 the New York Times publishes an article about the Ussachevsky’s experience at Bell Labs: Seven Times the Computer Said No: Vladimir Ussachevsky at New Jersey’s Bell Telephone Laboratories. Seven times is the number of error messages back by computer after the code reading. Beyond problems, Computer Piece No.1 (1968) was made by this first experiment. It was also called Piece for Computer. As many composers in those years, Ussachevsky wasn’t able to use the computer, so it was helped by Jean-Claude Risset and Richard Moore. Some digital sounds was used with others analogical treatments with the CPEMC’s facilities, and others no. Then there are in this piece even concrete sounds recorded by Ussachevsky. Two Images for the Computer Piece – The next computer music work is strictly linked to the previous. Two Images for the Computer Piece, dated 1969, frequently called Images of a Computer Piece, is the soundtrack of a Lloyd Williams‘s experimental film with the same title. This track is an elaboration of Computer Piece adding a percussive interlude composed by Raymond DesRoches. We – After some year Ussachevsky worked to new compositions to realize with the Groove system. The first of them is We (1970), a short piece for the radiodrama based on a novel of the Russian writer Yevgeny Zamyatin. This composition was commissioned by the Broadcasting Company and realized with the collaboration of Alice Shields. 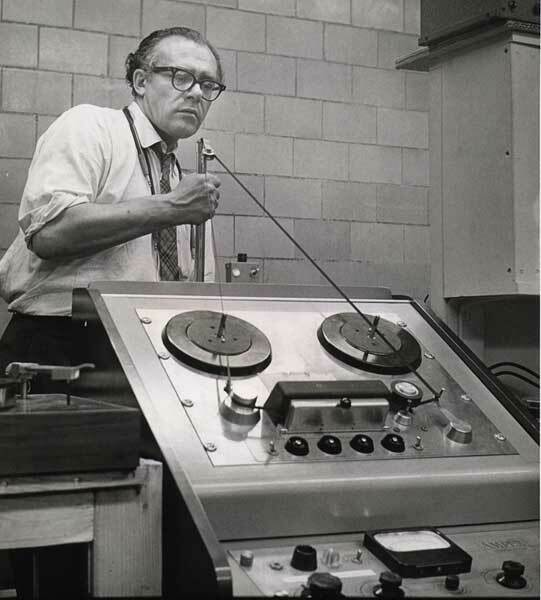 A beautiful picture of Vladimir Ussachevsky working with tape recorder. The Creation – In 1960 Ussachevsky starts to work to a new composition for chorus and tape which will complete thirteen years later. The Creation, in the early Seventies version has been articulated in four movements, everyone with some particular features. The first (duration 8:35) is titled Before the Beginning, or Enuma Elish, for two choruses and tape. Texts are based on the Enuma Elish Enuma Elish poem and ancient Akkadian writings or Ovidio’s Metamorphoses. The second movement (3:50), initially finishing the entire work, is linked also to Akkadians texts but the music was revised in 1973. The last two movements, realized during this revision work, use synthesized sounds with the computer of Bell Labs. The third movement was titled The Battle but sometimes called Conflict, an Electronic Scene from Creation. This a work of 6 minutes for tape, realized in collaboration with Alice Shields in 1973 and revisioned in 1975. Sound materials were synthesized with the Groove system. The last movement is an epilogue based on the Spell of Creation poem (from which the title) by the poetess Kathleen Raine. This movement, for soprano, chorus and tape, was relized in 1973 with the Music V program. Colloquy – The musical use of the computer ends with Colloquy (1976), although in those years more sophisticated devices appear, to satisfy needs of composers and musicians. However, after ten years of electronic music composed even with EVI instruments, Since the early eighties Hiller returns to conventional instruments, writing works for small ensembles, and orchestras. Colloquy anticipated these later tendencies; in fact it is a work conceived for symphony orchestra, tape and soloist instruments. The electronic part consist of Hiller’s voice recordings digitally processed. A curiosity: the score omitted the electronic parts so, theorically, musicians discover the electronic medium during the execution..
Last Years – The first execution of Colloquy took place at the University of Utah, where Ussachevsky was composer in residence since the Seventies. Ten years later, he moved to Utah as teacher, after leaving the Columbia. Togheter with Ercolino Ferretti, already involved in digital music, Ussachevsky organizes computer music courses. Furthermore they were dealing to set up the local electronic music studio, oriented, as obvious, in a digital way. So, Colloquy’s execution was the reward for all this work. Ussachevsky died of a cancer on January 4th, 1990. Andrews Lewin-Richter, Alcides Lanza, A Reminiscence of Vladimir Ussachevskyin the 1960s, Musicworks No. 82, 2002, pp. 24 – 31. David Ewen, American Composers: a Biographical Dictionary, G. P. Putnam’s Sons, 1982, pp. 682 – 686. Eric Salzman, Vladimir Ussachevsky: Electronic and Acoustic Works 1957-1972, CD, Liner Notes, New World Records, 2007, pp. 1 – 15. Eugene Bruck, Notes for Sounds of New Music, Folkways Records, LP, Liner Notes, 1958. Herbert Russcol, The Liberation of Sound: an Introduction to Electronic Music, Prentice-Hall, 1972. Joan Peyser, The Music of My Time, Pro/Am Music Resources, 1995, pp. 324 – 340. Jon Appleton, Ronald C. Perera, The Development and Practice of Electronic Music, Prentice-Hall, 1975. Otto Luening, Some Random Remarks About Electronic Music in Contemporary Composers on Contemporary Music, Elliott Schwartz (edited by), Da Capo Press, 1967, pp. 251 – 260. Patte Wood, Recollections with John Robinson Pierce, Computer Music Journal, Vol. 15 . Ralph Hartsock, Carl Rahkonen, Vladimir Ussachevsky: a Bio-Bibliography, Greenwood Press, 2000.